An amazing thing recently happened. A friend of mine, stationed at RAF Molesworth, the old airbase of the 303rd Bomb Group (H) in the western part of Cambridgeshire, came by my office. 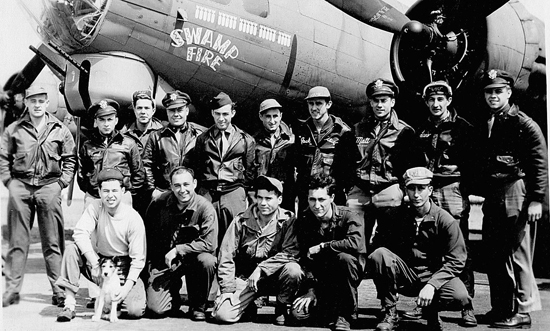 He brought me a box of old photographs – all photos from airmen and officers of the 303rd, part of U.S. 8th Air Force, taken during the Second World War at RAF Molesworth. He asked if I wanted them. Of course! I was amazed. They are wonderful historical records. On top of the stack of photos – there must be 70 – there was a handwritten note, which read: “Dupes of WWII photos donated by Malcolm Magid, plus copies from old JAC XO, CAPT Mewbourne.” This note tells me quite a few things, namely the photos were in the posession of the Joint Analysis Centre (JAC) Executive Officer (XO), who was a naval officer (the acronym CAPT is only used for a U.S. Navy Captain, the other branches of the U.S. military use different acronyms: Capt., CPT, or Capt). The JAC command has only been at Molesworth since 1990 – so that gives some idea of the timeline of the photos ownership. More importantly, Mr. Malcolm James Magid was a B-17 copilot who survived the war and passed away in Atlanta, Georgia on 16 May 2012 at the age of 88. He was stationed at RAF Molesworth and flew 35 missions over Germany during the War. He was highly decorated, even being made a Chevalier of the Légion d’honneur by the President of France for his aid in the Republic’s liberation. For the photos themselves, I asked myself what to do? First, I thought I will scan them in and post them here as a record of the brave men who served at RAF Molesworth, and in honor of Mr. Magid. Secondly, I will attempt to find Mr. Magid’s family (an obituary published in a local paper lists his descendants) and see if they would like these photos returned. If that effort is unsuccessful, I will contact the U.S. Air Force Historical Society and the 303rd Bomb Group Historical Society to see if the photos can be added to their collections. More to follow. This appears to be 2LT Malcolm Magid standing infront of a B-17 undergoing maintenance. B-17 Crew in front of aircraft. I am (moderately) confident that 2LT Magid is kneeling in the front row on the far left, wearing the peaked cap. The officer in the front row, third from left, is striking in how young he looks. Photo of a B-17 after making a wheels-up landing (the aircraft is in remarkable shape). Written on the negative is “COL. Heller… [illegible]” Colonel Heller was the 360th Squadron Commanding Officer, a subordinate unit to the 303rd Bomb Group (H). Inside a Nissen Hut. Of note: under the cot are flying boots, uniform dress shoes, and tassled loafers. The airman in the background is playing solitaire. Enlisted U.S. airman from RAF Lakenheath and RAF Mildenhall and two officers (the two men on the front right with the piping on their garrison caps) prepare to lay wreaths at the Cambridge American Cemetery, Remembrance Day (Memorial Day) 2015. Remembrance Day in Cambridgeshire. Poppies are respectfully worn on lapels, blouses, and occasionally on the front of a car. We all pause and think on the sacrifice of service members, their families, and all the overwhelming sadness of those who died in war. In this period leading up to 11 November 2018, which will be the centenary of the end of the Great War, it is important to pause and reflect on the loss of so many. I thought today I would simply post some images of the moving memorials which took place today. Huntingdon, Remembrance Day 2015. Thanks to the Hunts Post. Peterborough, Remembrance Day 2015. At the War Memorial. An image that personally touches me and the members of my village, this is our local war memorial which records the names of nine young men who fell in the Great War. It is horrific to think that in a village with a population of 280 in 1914, nine men would die in the war. On May 24, 1940 a Dornier 17-Z bomber got a lucky hit on a MK1 Supermarine Spitfire P9374 during an air battle over the beaches of Dunkirk. 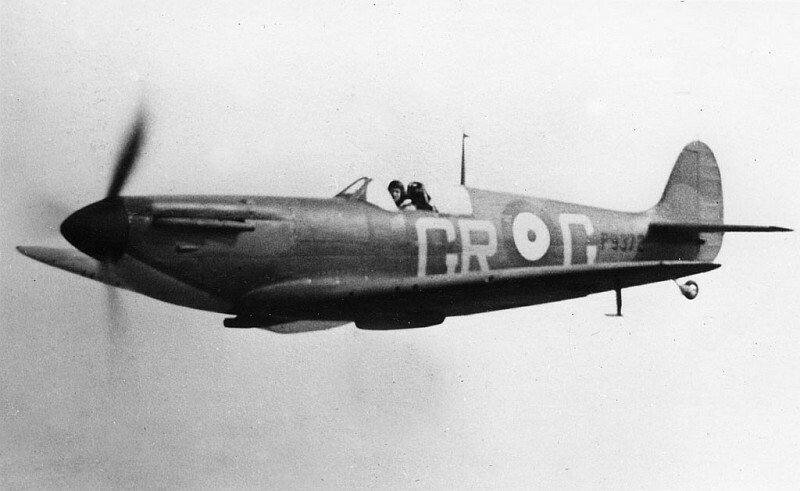 The MK1 Spitfire, flown by Flying Officer Peter Cazenove had taken off from RAF Croydon and flown over northern France to support the fighting on the beaches of Dunkirk. The Dornier brought the Spitfire down with a single bullet, which then crash-landed gear-up on the beaches near Calais. Uninjured, Flying Officer Cazenove left the aeroplane and walked to Calais where he joined a British unit fighting in the waning days of the Battle of France. Eventually he was captured and made a POW, ending up in Stalag Luft III in eastern Germany and becoming involved in the Great Escape. Flying Officer Cazenove survived the War. The Spitfire; however, stayed on the beaches of Dunkirk along with so much British military kit abandoned in the evacuation. Remarkably, a picture survives of two German servicemen sitting on the wreckage of P9374, half buried in the sand. 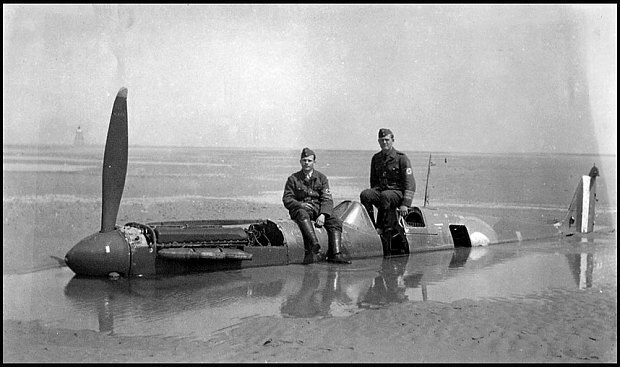 MK1 Spitfire P9374 on the beaches of Dunkirk in Spring 1940 with two German servicemen on her fuselage. © BNPS. 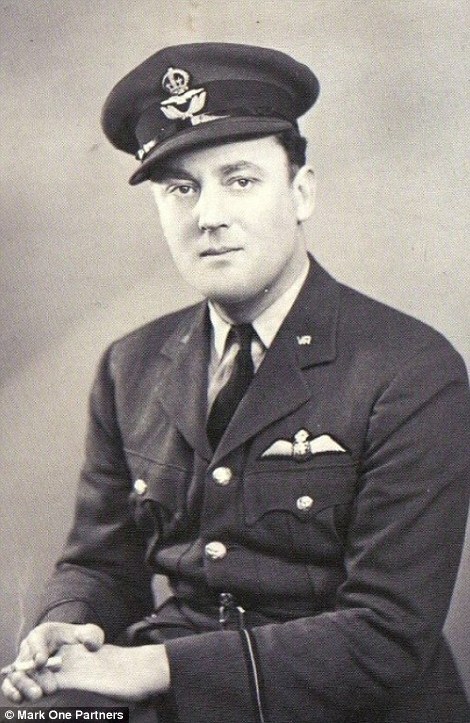 Flying Officer Peter Cazenove in 1940. © Mark One Partners. Eventually the tides coming in and out over Dunkirk buried the aeroplane where it was preserved for the next several decades until September 1980 when the fighter appeared back above the sands. 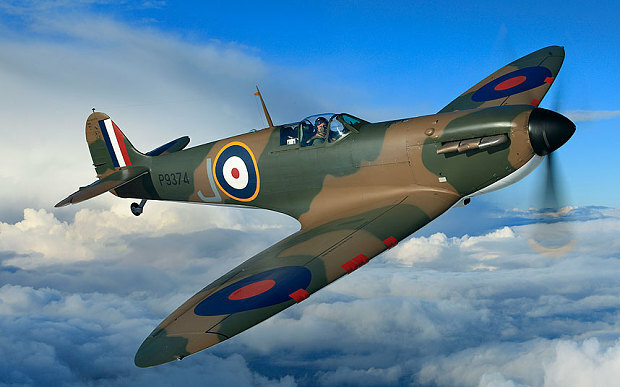 Lovingly restored and reassembled by experts and now at the Imperial War Museum in Duxford, Cambridgeshire, the Spitfire is now one of only two flying MK1 Spitfires in their original specifications (there are many other flying Spitfires of different variants). 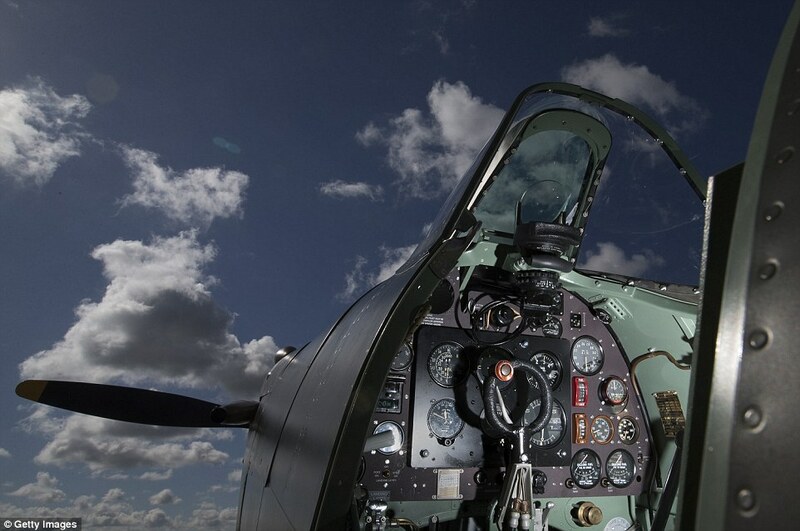 MKI Supermarine Spitfire P9374’s cockpit. Photograph taken at IWM Duxford, Cambridgeshire, 2015. © Getty Images. MK 1 Spitfire P9374 was built in 1939. Its Merlin III engine was completed at the Rolls-Royce Factory in Derby on October 27, 1939. The aeroplane had only 32 hours of flying time when it was brought down over France. It was one of the renowned No. 92 Squadron’s fighters based at RAF Croydon in March 1940. MK1 Supermarine Spitfire P9374 in flight over Cambridgeshire in 2015. © John Dibbs, SWNS.com. Amazingly, this aeroplane is going on sale. On July 9, 2015 at Christie’s in London, P9374 will go on sale and is expected to fetch between £2- £2.5 million. The proceeds of the sale will be shared between two charities – the Royal Air Force Benevolent Fund and Panthera Corporation, a wildlife conservation charity Mr Thomas Kaplan and his wife, Ms Dafna Kaplan, founded in 2006. Mr Kaplan, an American billionaire investor who is a world renowned conservationist, art collector, and Oxfordian, is the generous individual behind the sale. 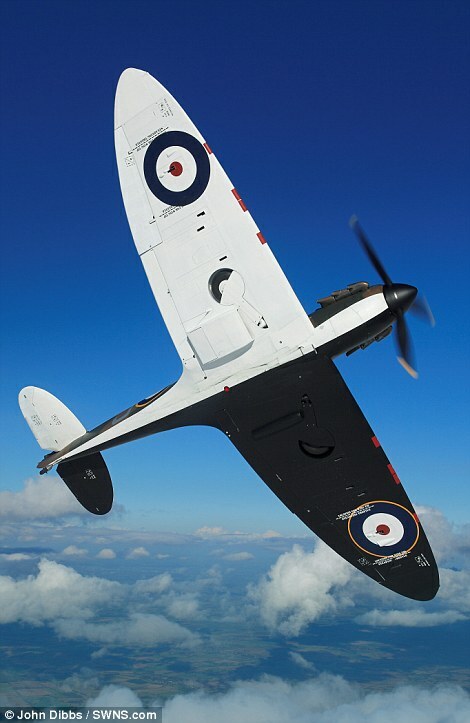 The second flying MK1 Spitfire in the world was also restored by Mr Kaplan’s experts. Numbered N3200, he has generously donated the MK1 Spitfire to the Imperial War Museum, Duxford, where it often flies and is available to all visitors to admire. One of her sister aircraft, MK1 Supermarine Spitfire P9372. An early photo of a No. 92 Squadron Spitfire Mk1, The GR codes date it to the Spring of 1940 and the lack of an armour plated windscreen dates it to before the evacuation of Dunkirk. P9372 was shot down over Rye in September 1940. The wreck was recovered and much of the aeroplane is on display at Biggin Hill Heritage Hangar. Unknown Photographer. I often write in this dialogue with you about the local history of Cambridgeshire, and frequently about the efforts during the Second World War which originated from the bases and airfields spread throughout southeast England. However, this week I find myself in the small town of Böblingen, Baden-Wurttemburg, in southwest Germany. It is an ancient town which was accidentally bombed during the war, bombed and destroyed. Here one sees the horrific reality of what 8th Air Force and Bomber Command’s strategic bombing wrought on the ground. The level of destruction waves of heavy bombers were capable of achieving in an effort to destroy Germany’s military might is sobering. This small town is but one example of millions of lives that were horrifically changed by the Second World War – and is not a judgment on guilt or innocence – but is simply what happened. “Böblingen 01 1939-07-01” by Ansgar Walk – Foto erstellt von Ansgar Walk. The town on 1 July 1939. On the night of 7 October 1943, 343 Avro Lancaster Bombers, launching from airfields in Cambridgeshire and beyond, formed up and began a major night raid on the military-industrial targets of Stuttgart. It was overcast and dark, some of the aircraft from the 101st squadron were equipped with night-fighter jamming equipment (this was “CIGAR” first operational use in a combat mission). This allowed the bombers to conduct the raid with little resistance. A diversionary raid on Munich further confused the German fighters and the bombers reached their targets relatively unhindered and dropped waves of ordnance, explosives followed by incendiary bombs, losing only four aircraft that night. The mission was hailed as a success – for the industrial capacity of Stuttgart needed to be destroyed to slow the German war machine. 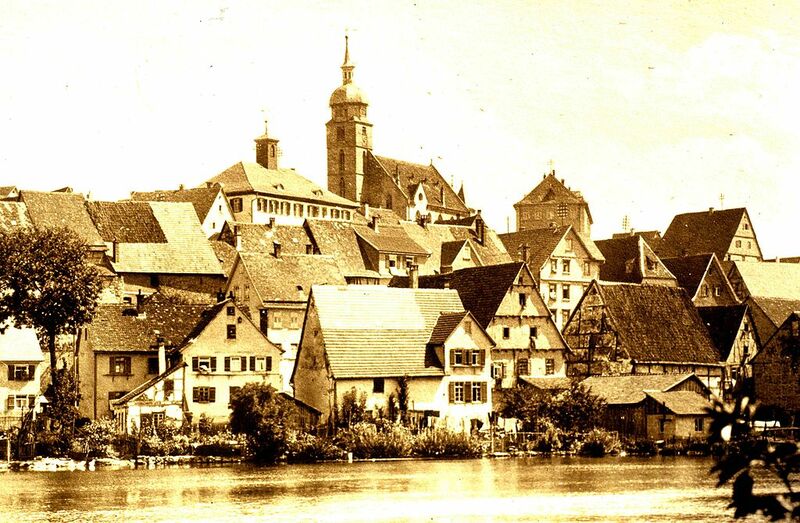 Things were very different in the sleepy town of Böblingen, 10 miles southwest of Stuttgart, where no military targets were located. By mistake, one of the two pathfinders which dropped aerial markers to guide in the remaining bombers, marked Böblingen instead of the industrial facilities of Stuttgart. Following the pathfinder’s lead, the Lancasters dropped 35 high-explosive bombs before over 400 incendiary bombs over the unsuspecting town. 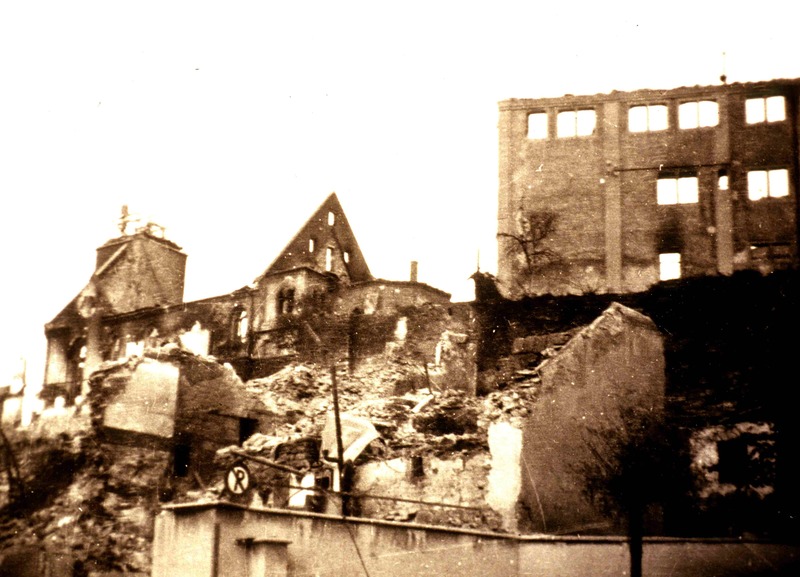 The Schloβberg, church, and over 70% of the old town was destroyed. 1,735 people lost their homes, and most tragically, 44 people died including 24 women and children. 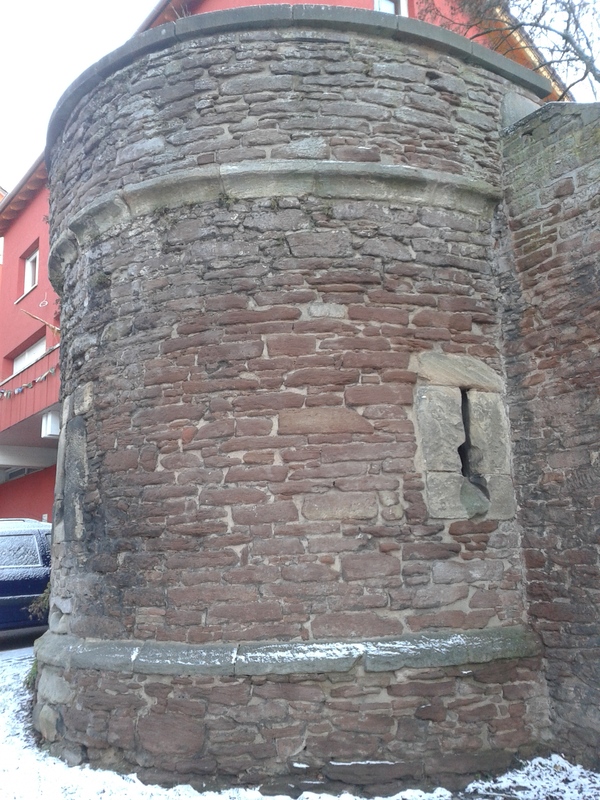 As I walked around the Schloβberg this week, which still is the central part of the rebuilt town, I found small intact pieces of the medieval castle which survived the night. One can still see the black scorching on the medieval stones, which were burned permanently into the rock by the inferno caused by the incendiaries. It isn’t hard to picture the horror of that night to the people of this small town, rushing about, seeking shelter and tending to the destruction. Source Foto erstellt von Ansgar Walk. Photograph by Ansgar Walk . The shell of the nave of the protestant church can be seen in the center of the photo, where the remembrance memorial now stands. 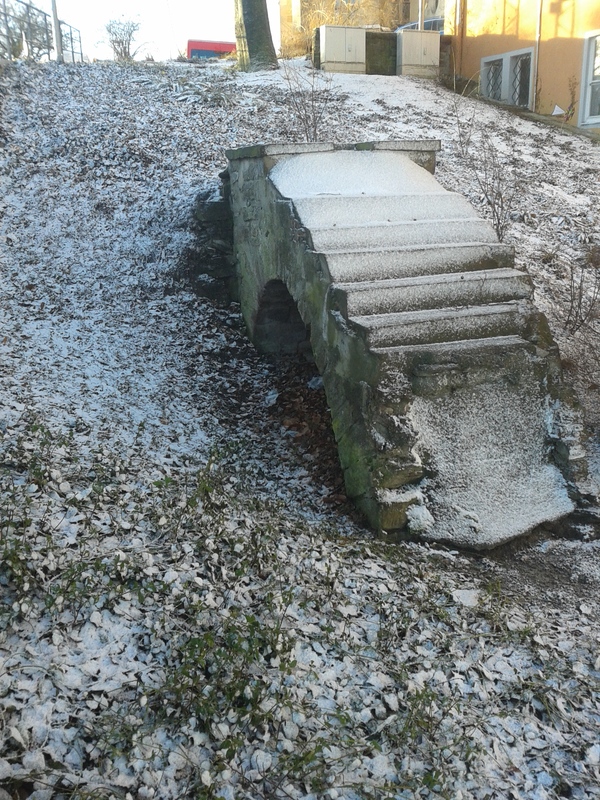 A small piece of the Boblingen castle, completely destroyed on the night of 7 October 1943. This piece of archway lies buried in the hillside. © cambridgemilitaryhistory.com, 2015. A medieval tower remained after the bombing of the castle. It now is perched on the highstreet, between buildings from the 1950s and beyond. A testament to the almost complete destruction of Boblingen’s center. © cambridgemilitaryhistory.com, 2015. 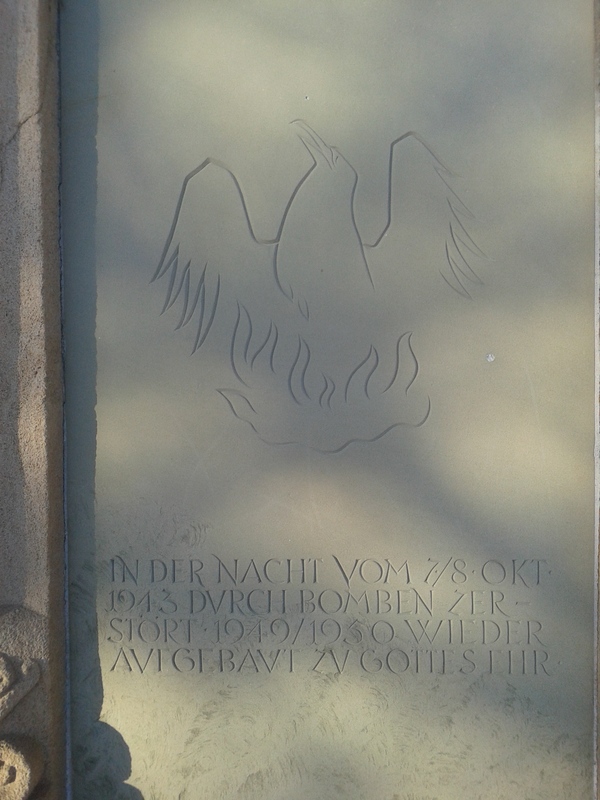 The memorial stone on the rebuilt nave of the protestant church in Boblingen. © cambridgemilitaryhistory.com, 2015. Sadly, another very similar event happened in 1944, when Böblingen was once again struck out of confusion by bombers seeking the heavy industry of Stuttgart. More deaths, more destruction in this small town so desperately affected by the Second World War. A check of the Statistisches Bundesamt, the Federal German Records Office, shows that in the last census before the war, Böblingen had a population in 1939 of 12,560. In 1946, 10,809 people were counted in the town. 1,751 people had disappeared from the town. Behind those numbers are enormous tragedies: lost civilians in the raids yes, but also lost soldiers, dispossessed families that left never to return, and even those murdered by the regime. Time has passed now and I don’t seek to judge or to search for any more horror here. A tragedy has woven together with accidental targeting of an unimportant town, spurred by the deliberate bombing of military-industrial targets, the civilian losses, the impact of the war on these people, but also the crews of the four Lancasters which were lost that night, and the overall efforts of so many for so long during a dreadful time. The greater tragedy of the Second World War can best be found in seeking the personal stories, the human struggles of so many in the face of such horror over so long. Writing to you from Böblingen, Germany. Brandon. Between Huntingdon and Peterborough, in the west of Cambridgeshire lies the small village of Conington. With its beautiful All Saints Church, first mentioned in Domesday Book and rebuilt in the early 16th Century, and remarkably beautiful cottages and homes perched on the edge of the fens, one can hardly imagine that 70 years ago this was the home of four squadrons of B-17 Flying Fortresses, roaring into the air almost daily for targets in Germany and Occupied Europe. 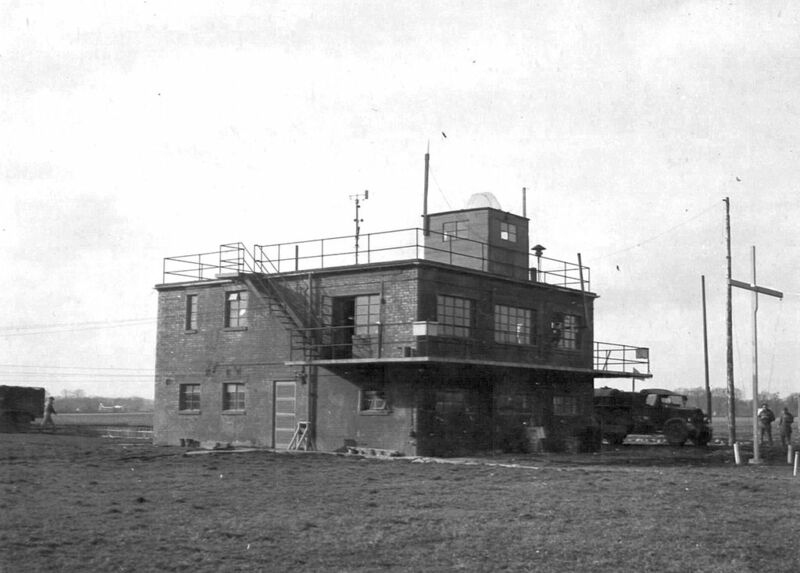 The Control Tower, now demolished, of RAF Glatton, taken on 31 March 1945. 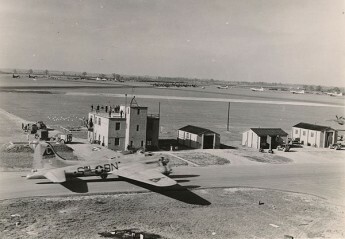 In the distance, to the left of the tower, a B-17 is visible on the taxiway. US Air Force Photograph, in the public domain. In the Second World War, Conington was located next to Royal Air Force Station Glatton, which was constructed to Class “A” standards by engineers to support heavy bombers in 1943 with the intent of being used by the U.S. Army Air Forces in the strategic bombing campaing. The 457th Bombardment Group (Heavy) arrived on 21 January 1944, consisting of the 748th, 749th, 750th and 751st Bombardment Squadrons. The recognizable tail code of the 457th was the “triangle U” painted on the vertical stabilizers of the Boeing B-17 Flying Fortresses which operated from the air base. 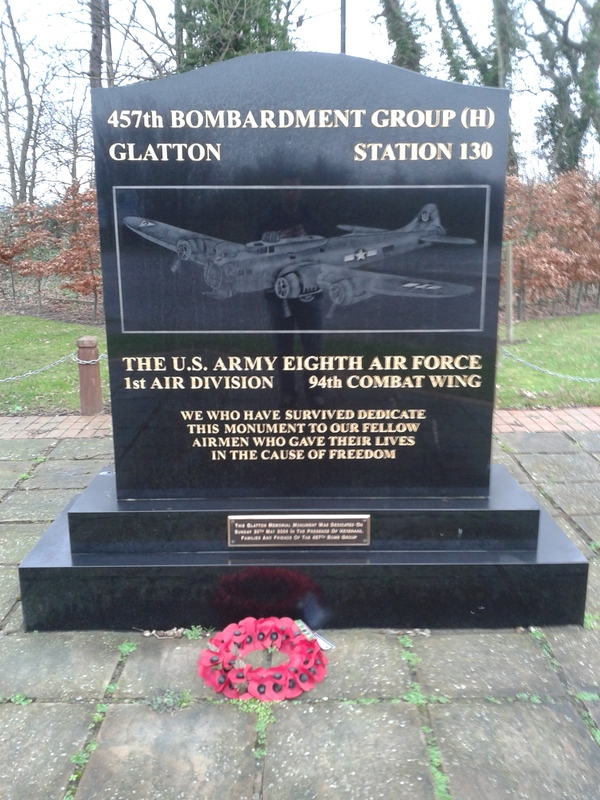 The 457th Bomb Group operated RAF Glatton from January 1944 until 20 April 1945, when it completed its 237th and last combat mission at the conclusion of the war. Before June 1944, the 457th operated on attacking stategic targets in Germany – munitions factories, ball-bearing plants, marshalling yards and oil refineries. On D-Day, the 457th flew missions against Cherbourg Peninsula, attacking German positions off the east flank of American forces landing at Utah and Omaha beaches. By July 1944, the 457th had resumed strategic bombing and would continue to focus on German targets through April 1945. However, the 457th provided aerial bombing support to the breakout from St. Lo in northern France, the British 1st Airborne’s landings at Arnhem in the Netherlands, and in support of embattled U.S. Army forces in the Battle of the Bulge. At the conclusion of the War, the B-17s of the 457th Bomb Group returned to the United States and the airfield was used by No. 3 Group of the RAF Bomber Command flying B-24 Liberators and Avro Lancaster heavy bombers. By 1948, it was decided that the airfield was surplus and the land was returned to agricultural use and demilitarized. A marker placed at the foot of the watertower, which is a moving remembrance to the men who paid the ultimate sacrifice flying from RAF Glatton in the Second World War. © cambridgemilitaryhistory.com, 2015. Today, one of the Class A runways remains in use as the “Peterborough Business Airport” which is a general aviation facility. It is a testament to the strength of the runways built over 70 years ago that the field remains in limited and lighter use. 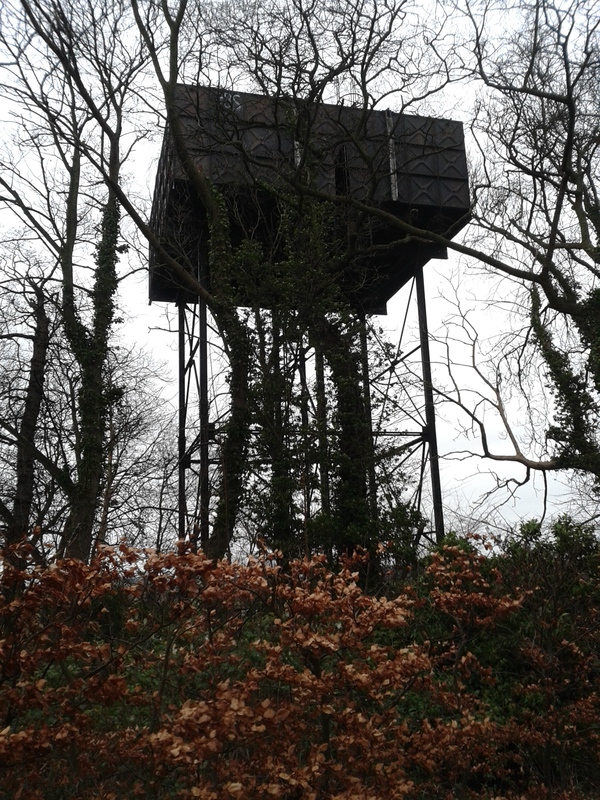 The only other structure from the Second World War is the watertower which stands near the 457th Bomb Group Memorial, off Great Ermine Street, near the village. In All Saints’ Church, Conington, is a memorial to the 457th Bomb Group which must be visited. 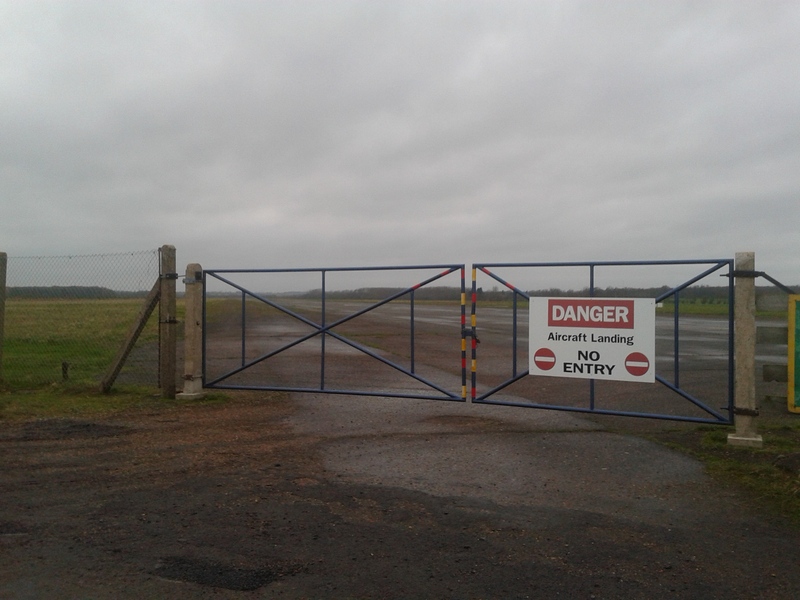 At the end of the Peterborough Business Airport’s runway, still in use from the Second World War as a general aviation facility. 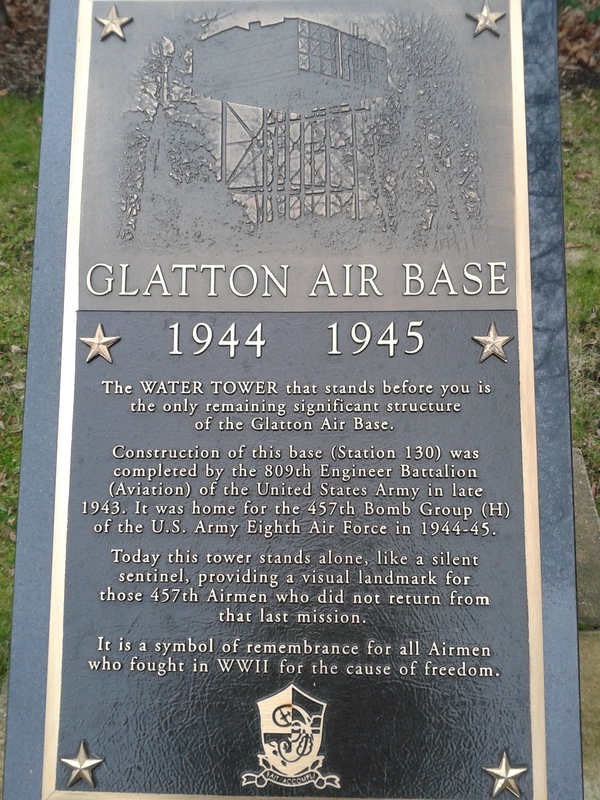 A marker placed at the foot of the watertower, which is a moving remembrance to the men who paid the ultimate sacrifice flying from RAF Glatton in the Second World War. © cambridgemilitaryhistory.com, 2015. To see RAF Glatton, travel up the A1(M) and exit at the B660, signposted to Conington. A few miles west of Huntingdon, Cambridgeshire, between the villages of Stow Longa and Kimbolton, rests a flat, windswept area of farmland that the B-road snakes across. One can easily miss the short stretch of narrow road that cuts across the older, crumbling concrete of class-A taxiways that once carried B-17 Flying Fortresses to the main northwest-southeast runway. If you stop and trudge out across the muddy public footpath which heads due west, you will come across patches of concrete, often covered in hay bales for the local livestock. It is an eerie scene, for one cannot help but picture the heavy bombers combing back from a mission deep over Germany, and in the strong winds that blow across the flat fields, one can almost hear the engines of the bombers. 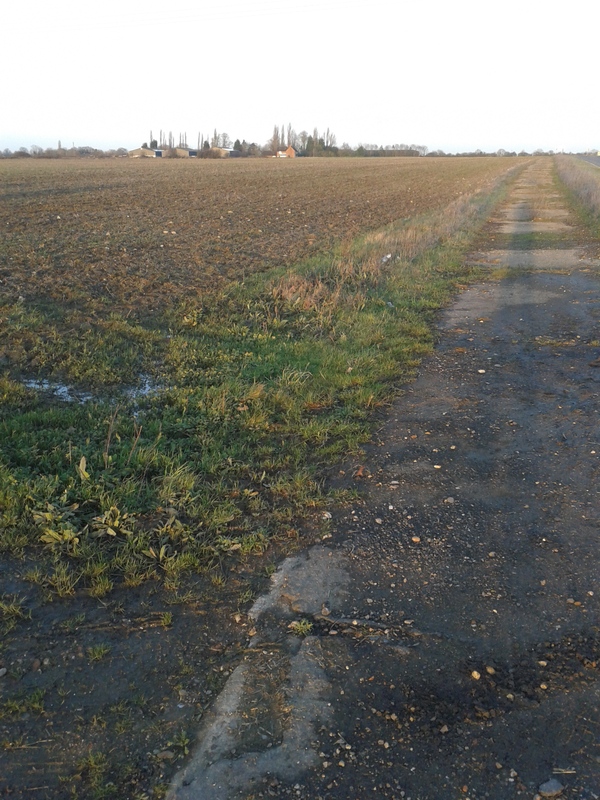 A fascinating discovery, when standing on the shoulder of the B-road which connects the villages of Stow Longa and Kimbolton, the original runway can be seen which the road was paved over in the following decades. © cambridgemilitaryhistory.com, 2014. 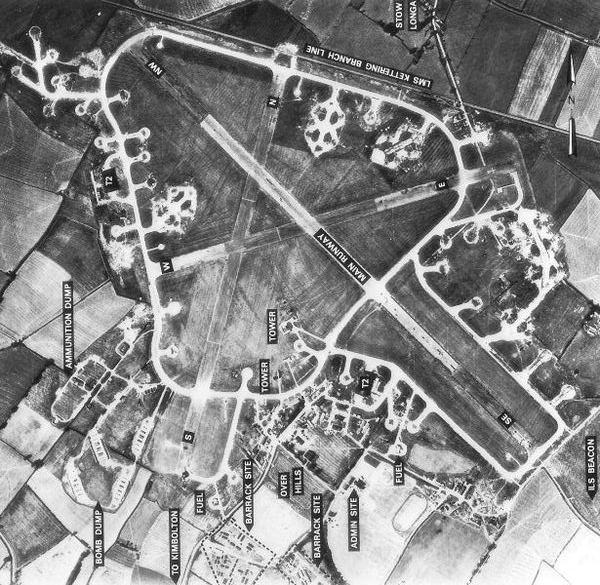 RAF Kimbolton on 10 August 1945. The village of Stow Longa is just visible on the top of the aerial photograph. The village of Kimbolton is to the south. This artistic work created by the United Kingdom Government is in the public domain. 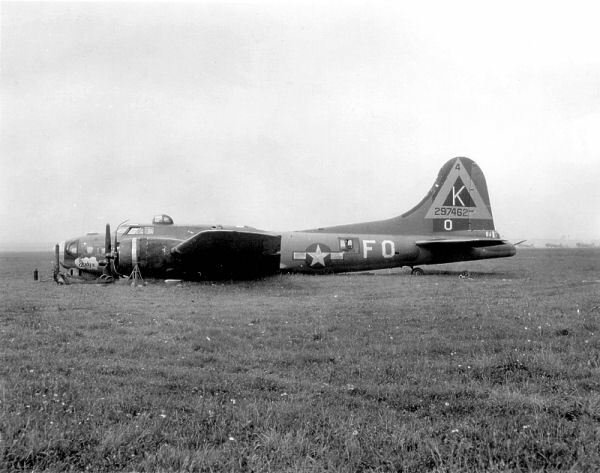 Then came the 379th Bomb Group (Heavy), with its famous “triangle-K” markings on the vertical stabilizers of the B-17s, which would operate from RAF Kimbolton until the end of the war. Four squadrons: the 524th, 525th, 526th and 527th Bombardment Squadrons comprised the 379th which flew its first combat mission on 19 May 1943. Focused on the war-making capabilities of Germany, the 379th flew raids on heavy industry, refineries, warehouses, submarine pens, airfields, marshalling yards and command and control centers across occupied Europe. They flew bombing missions against the ball-bearing plants at Schweinfurt and Leipzig, against synthetic oil plants at Merseburg and Gelsenkirchen, against the chemical plants at Ludwigshaven and airfields from Occupied France to Berlin. A B-17F belly landed at RAF Kimbolton. An amazing testament to the rugged airframe, this B-17 was repaired and returned to a flying status. U.S. National Archives, This image or file is a work of a U.S. Air Force Airman or employee, taken or made as part of that person’s official duties. As a work of the U.S. federal government, the image or file is in the public domain. On 11 January 1944, the 379th attacked aircraft factories deep in Germany without fighter cover, earning the unit the coveted Distinguished Unit Citation. Before D-Day, the group focused on strong fixed positions, rail transfer and choke points, and gun batteries: softening up the Atlantic Wall before the greatest amphibious invasion in history. B-17F at RAF Kimbolton. Note the “Triangle K” tail marking. U.S. National Archives; this image or file is a work of a U.S. Air Force Airman or employee, taken or made as part of that person’s official duties. As a work of the U.S. federal government, the image or file is in the public domain. B-17 Serial #42-32024 “Swamp Fire”. This is a picture of the mission crew who flew on her 25th mission on 4 May 1945 (note 24 bombs painted on her side for completed missions). Standing, left to right: TSGT Edward J. Przybyla radio operator, 2LT Harvey “Herk” Harris bombardier, SSGT Roy E. Avery, Jr. waist gunner, 1LT Joseph L. Korstjens pilot, SSGT Andrew Stroman, Jr. ball turret, SSGT Berj G. Bejian engineer, SSGT John K. Rose waist gunner, 2LT Matthew J. Scianameo navigator, SSGT Elijah W. Lewis tail gunner, 2LT Byron B. Clark copilot. The dog is “Lt Scragg” swamp fire’s mascot. Kneeling left to right is the ground crew: Rube Cohn, Seymour Romoff, James Abbott, Henry Gerhart and Dominick DeSalvo. Thanks to the Swamp Fire website for this image. The 379th Bomb Group holds the record for the most tonnage dropped of any U.S. Army Air Force Bomb Group operating from the United Kingdom – 26,459 tons of ordnance. The 379th holds the record for most missions flown: 330 between May 1943 and May 1945. In June 1945, the 379th transferred from RAF Kimbolton and the base was closed temporarily. From the late 1940s until the early 1960s, the Royal Air Force used the base for basic training of new recruits before it was finally closed, dismantled and returned to agricultural use. 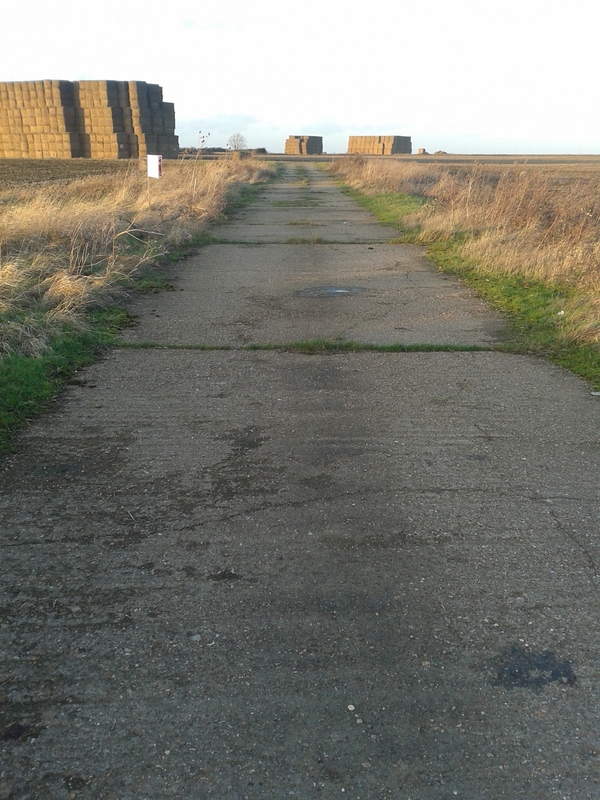 One of the concrete tarmacs of RAF Kimbolton today: broken concrete stretching towards where the control tower once stood, now all farmland. © cambridgemilitaryhistory.com, 2014. 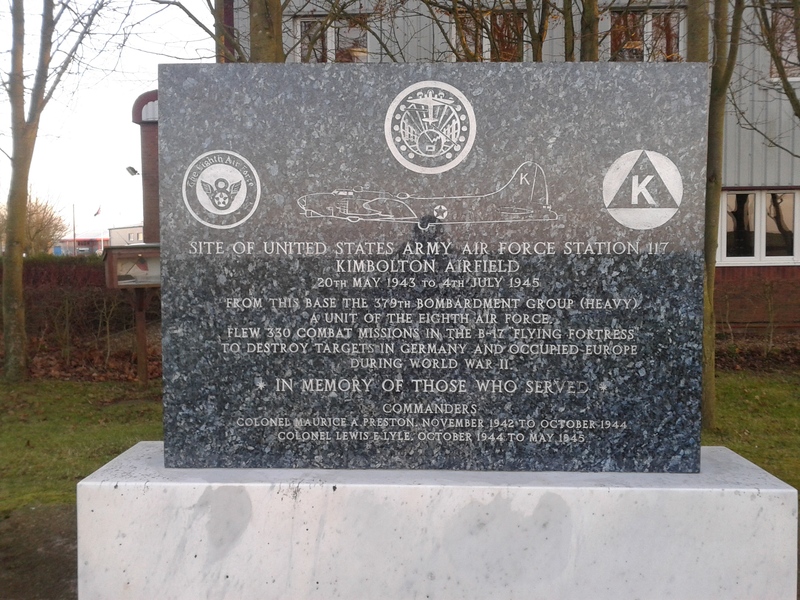 The 379th Bomb Group (H) memorial, located on the southeast corner of where RAF Kimbolton once stood. Of note, a book of honor stands next to the memorial listing the names of the men who died for their nation, and for the freedom of others, who flew from RAF Kimbolton. © cambridgemilitaryhistory.com, 2014.